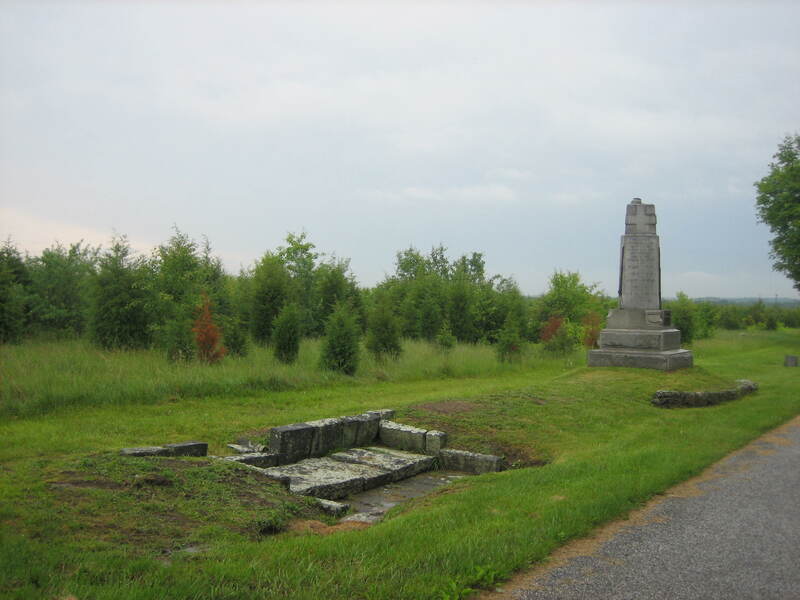 A view of some of the monuments on Howe Avenue looking across the Taneytown Road to Wright Avenue. The monument to the 49th Pennsylvania is to the right. Big Round Top is in the distance. The unit occupied this area, facing to the south, early in the morning of July 3, 1863 with it’s right on the Taneytown Road. This view was taken from the east facing west at approximately 4:30 PM on Wednesday, June 4, 2008. In between Wednesday’s thunderstorms, the Gettysburg Daily ventured to seldom visited Howe Avenue. 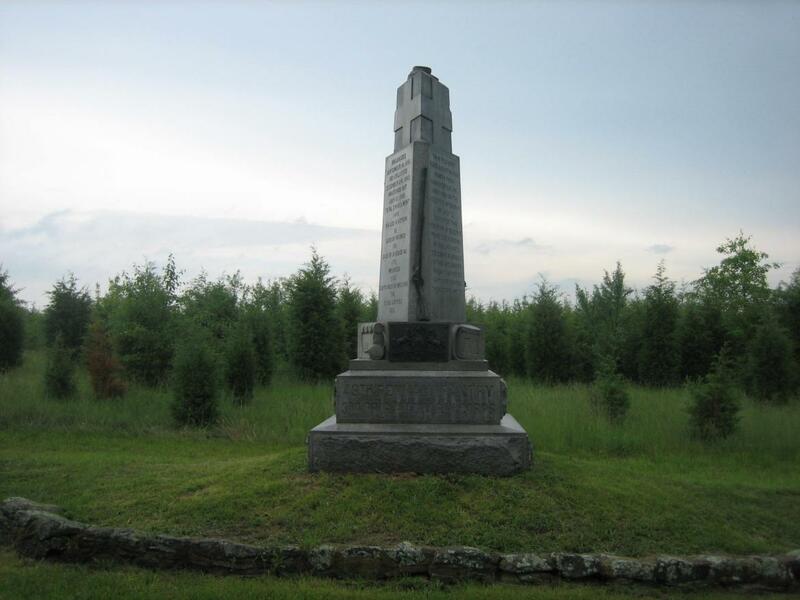 The subject of today’s photographs is the monument to the 49th Pennsylvania Infantry Regiment. The monument is slightly interesting because of the triangular top of the monuments which sits on a square base. Howe Avenue was created in November 1909 when the Park Commission decided to grade and surface with stone the 950 foot long area named after the commander of the Second Division of the Sixth Army Corps, Albion P. Howe. The front of the monument. 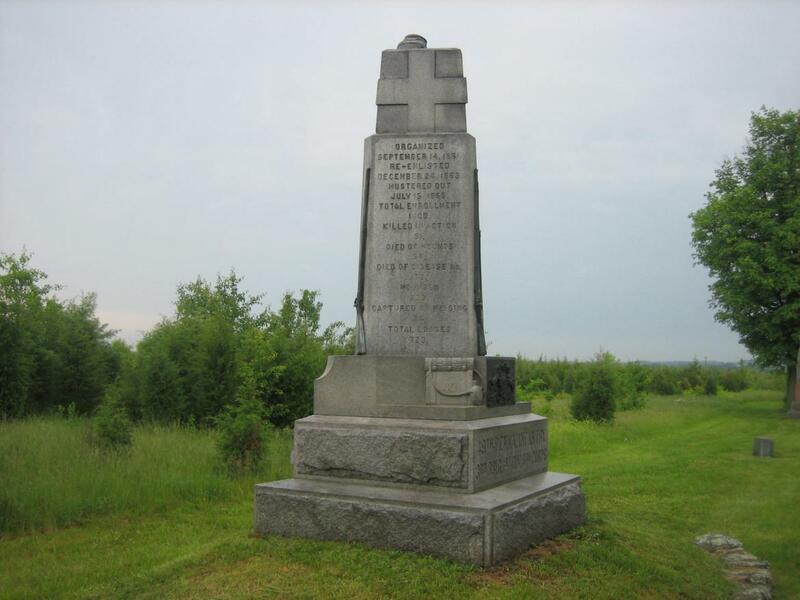 One June 4, 1863, the 49th Pennsylvania was encamped at White Oak Church, near Fredericksburg, Pennsylvania, where it remained until June 6, 1863. 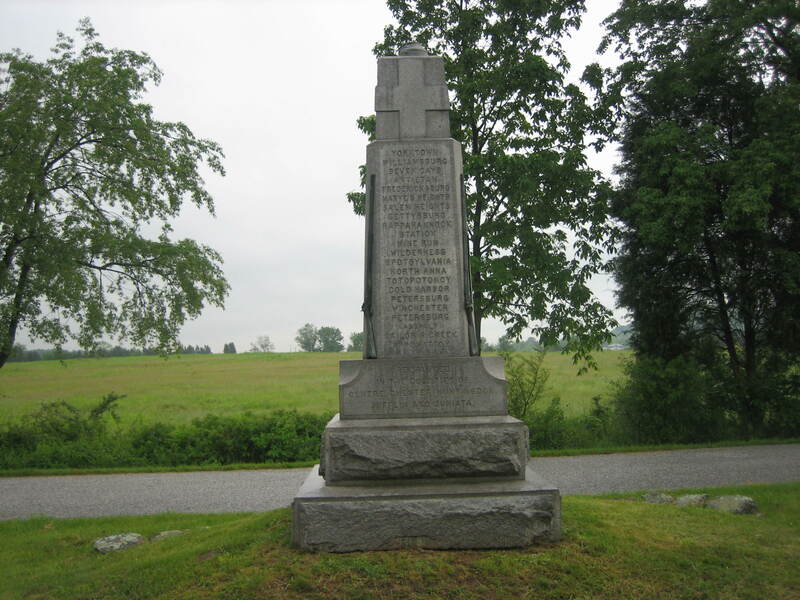 It began the Gettysburg Campaign on June 11, 1863 and moved “leisurely” into Maryland. One the march north the weather was “excessively hot.” Some men suffered from sunstroke. The regiment reached Westminster, Maryland on June 30, 1863. This view was taken from the southwest facing northeast at approximately 4:30 PM on Wednesday, June 4, 2008. The southwest side of the monument. On the evening of July 1, 1863, an order was received for the Sixth Corps, of which the 49th was a part, to move “with all possible dispatch” to Gettysburg. On daylight of July 2, 1863, the unit moved out at the “quick-step.” They arrived on the battlefield to support the Fifth Corps around 2:00 PM that day after a march of 34 miles. This view was taken from the southwest facing northeast at approximately 4:30 PM on Wednesday, June 4, 2008. The rear of the monument. 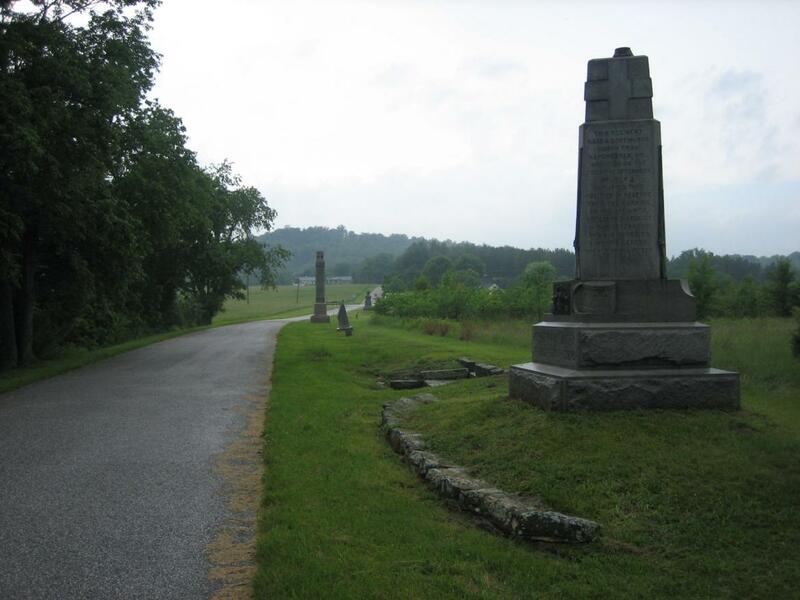 This is the general direction in which the regiment was facing early in the morning of July 3, 1863. At 3:00 PM on July 3rd, the unit was order “to the right of Round Top.” The unit was under some artillery fire, but did not suffer any casualties during the battle. At “dawn” on July 4, 1863, Company A of the 49th was sent out as skirmishers near Devil’s Den. This view was taken from the southwest facing northeast at approximately 4:30 PM on Wednesday, June 4, 2008. There is a walled in spring to the west of the monument to the 49th Pennsylvania. On July 5, 1863, the 49th Pennsylvania was part of the pursuit of Lee’s army and had a “slight” skirmish with the Confederates at Fairfield. They passed through Emmitsburg and Mechanicsville (Thurmont) and reached the foot of the Catoctin Mountains at “dusk” on July 7, 1863. This view was taken from the southwest facing northeast at approximately 4:30 PM on Wednesday, June 4, 2008.